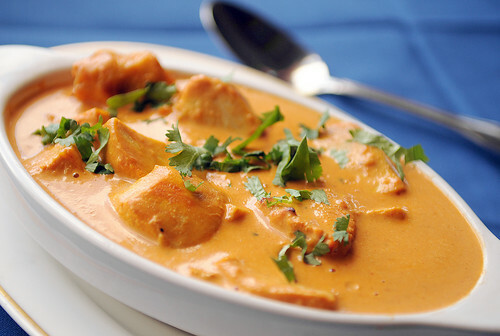 Butter Chicken is delicious and is equally well known in countries all over the world. The roots of this amazing chicken dish are traced back to famous Moti Mahal restaurant in Delhi, India. The butter chicken is great to taste, easy to make and is known for its spicy gravy or curry, which enhances the overall look of your plate. Pick up a large non- metallic bowl and add juice of a fresh lemon, salt to taste, and 1 teaspoon of red chilli to it. Now, combine all the ingredients until they mix thoroughly. Cover your bowl completely with a warping sheet and set it aside at room temperature for approximately 1 hour until marinate. Meanwhile, grab a large flat fry pan or a griddle and place it on the stove at medium heat. Roast on the bay leaves, almonds, cloves, and peppercorns. Stir all these ingredients thoroughly until they turn darkened slightly. Remove the fry pan from heat and set it aside at room temperature until cool well. Grab a dry coffee grinder and add the cardamom seeds along with the spices the spices to it. Grind all the ingredients for few seconds until mix well. Pick up another medium bowl and place the previously prepared spice mixture in it. Add 1 cup of fresh yogurt to the bowl and combine all the ingredients until mix completely. Once the ingredient in your bowl mix well, place cuminutes, turmeric powder and coriander in it. Add 1 kg of skinless and boneless chicken to the bowl and combine it well with the mixture in it. Next, select another small bowl, and mix yoghurt in it along with the whole spice powder prepared in the step above. Set the bowl at room temperature for at least 1 hour until marinate. Grab a deep fry pan and pour 3 tablespoons of oil init. Place it on the stove at medium heat until hot. Add 2 properly chopped onions to the hot oil and fry them until pale or golden brown in colour. Once your onion turns light brown, add the ginger and garlic pastes to it and fry them at medium heat for at least 1 minute. Now, fry the chicken- spice mix at medium heat until sealed well. Add 2 tablespoons of dried fenugreek leaves tomato paste, the fresh yogurt mixture to in the chicken mixture. Now, cook your chicken mixture at normal heat until it tenders and the gravy. Once the chicken mixture becomes gravy, the quantity of its ingredient will reduce to about half of the original amount of the ingredients. Grab a small frying pan and add 3 tablespoons of soft butter un-melted to it. Place the fry pan on the stove over a medium heat and let the butter melt well. Pour the melted butter over your chicken. Your yummy chicken butter is ready; garnish it with some coriander leaves to give it a delicious final addition. Enjoy! 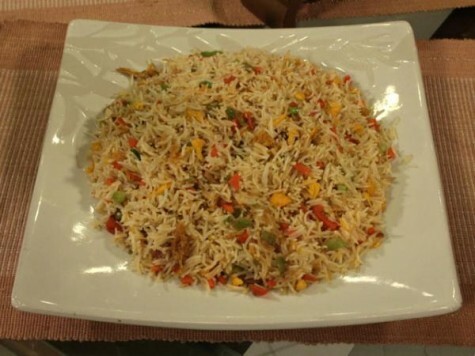 Time to enjoy your meal with cooked butter chicken and fried rice.